Sushi des Artistes offers a unique and fine dining experience where you can choose from a wide selection of Japanese dishes. Sushi des Artistes also boasts an extensive variety of sake, world wines and vintage Champagnes. "The Sushi Des Artistes menu offers an experimental take on Asian food, highlighted by the 6 or 8 course tasting menus. The imaginatively titled dishes include ‘Je t’aime’, a dish of slow-grilled foie gras with lemon butter soy on grilled pineapple, and ‘Why not’, comprising braised pork belly and apple purée. Signature grill dishes include Japanese-style ribeye steak with pepper, onion and ginger sauce, and grilled eel and mango with soy-mirin reduction. 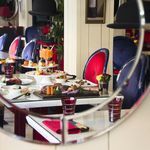 The Sushi Des Artistes restaurant is also home to exotic desserts including chocolate terrine and mascarpone with orange chili, and mixed berry sorbet in mango soup. 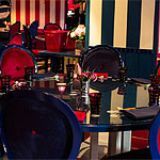 Elaborate signature cocktails are on offer, and can be enjoyed in the unique and colourful surroundings which include bowler hat light fittings and lavish chandeliers. 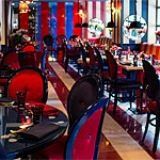 Sushi Des artistes is a 6-minute walk from South Kensington Tube Station." What did you think of Sushi des Artistes? Brilliant service,food and wine, wonderful ambiance and attention to detail.I will definitely go back for the exquisite Foie Gras Nigiri and Toro Truffle.Highly recommended! 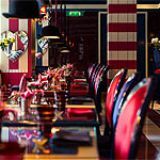 I was just passing by and noticed that they've opened up a massive new restaurant in my neighbourhood Chelsea.This restaurant huge with lots of cute decoration and tables to sit in. The staffs are just best in London! New design sushi with pink colour rice is just amazing. Sashimi are very thin cut and eye catching presentation. Recommended! Great experience! I was with my guest and we had a business dinner, I choose Sushi des Artistes because the ambient is elegant and professional. The staff was really helpful always and food was fantastic! All dish have amazing decoration! I ll recommended to my friend. Just came back from a romantic dinner at sushi des artistes. We had the 6 course set menu, which felt more like a long culinary experiences, mostly exiting. The restaurant space was huge and the service matched (probably exceeded) our expectations, with a courteous, but approachable and genuine attitude from the young staffs. Met with chef and explained who he made the home made macrons. Definitely recommended for that special evening and deserves more than one Michelin star. It was Great Night , 31st of Dec. Very good Staff, and Food. Most important thing was friendly , Smiley Staff , All of Them. We could feel what Sushi des Artistes will make Big Wave in London !! Absolutely delicious and lovely presentation! To die for! We found Sushi des Artistes from one of my friend she just stays near that restaurant, due to its location near the Kings Road , after shopping we had set lunch menu, which was full of new model Japanese taste and worth to spend it. Great service and tasty food! Their restaurant decorations are can beat to Chelsea restaurant. All the staff were very friendly and attentive! Will definitely have a family dinner here as my father loves Japanese food! I can't wait! I got recommended by my friend. It was great at Sushi des Artistes in London. Taste good, friendly service! Next time I would like to go with friends for a party I want to try more Sushi! Everyone must try! Went there with my girlfriend last weekend. They opened 3 weeks ago but already my new favourite. My girlfriend ordered tomato soup with clam to start which looked like she was having a cocktail. I had no chance to try it, she loved it. I tried the grilled duck which was just perfect. Juicy, pink and lots of flavours. My girlfriend doesn't really like sushi, but I had to order another platter because we ended up sharing. Very beautiful presentation and everything just melted in my mouth. They serve the sushi with lots of different kind of fruits so when the waitress served it she told us to try the sushi with every fruit. I thougth it is a bit weird but after the first bite I did beleive her. After we finished the sushi platters, the head sushi chef came to the table and had a little chat with us. We felt so special. This is the feeling what I already forgot. Whenever you go to eat somewhere you get food, sometimes good food and service, sometimes good services, but not this kind of positive attitude. I know they just opened and everyone is very passionate at the beginning, but I do believe they will keep this later as well. Just want to say a big thank you for all the staff at Sushi des Artistes to make us feel special. I have to say Sushi des Artistes is outstanding! It's going to blow all the Londoners away ~ very unique sushi beautiful presentation, good service, I would say to everybody "go now" before it gets packed. 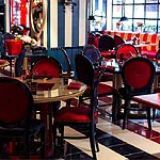 I went there with my friends and we were really impressed - the food was amazing - from starter to dessert, the staff - very welcoming and attentive, the atmosphere just lively! We already booked for next week! Been for my birthday,i had the perfect dessert "bon anniversaire" with fresh white truffle! My new favourite japanese!